After stating to my husband ”I’d love to be a fly on the wall for that talk” we decided that I should be a fly on the wall, and I bought a ticket to attend. 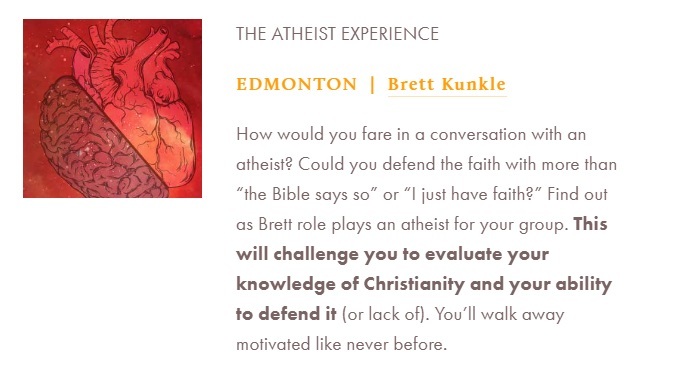 Much to my surprise, this talk did not misrepresent the atheist position at all. Basically, the speaker pretended to be an atheist philosophy professor and he allowed the audience to try to challenge him on his views, by asking questions or answering specific points he’d made on the atheist position. After the session of questions and answers was over he asked them to rate themselves on a scale of 1 – 10 on how well they thought they had defended their faith. The group settled on a 4 out of 10 (while I felt it was a 0, they had not provided any new arguments). The grade of a FAIL was exactly what the speaker was hoping for. At one point an attendee pointed out that they agreed with many of the things he said while he was the atheist, and this concerned them. The speaker replied with ”that’s because they are right!” and I realized just how brave he was asking them to challenge atheists, as surely deconverting would also be a high possibility. His talk had two points. First; that there is no ”gotcha” winning statement that anyone can throw out and convert people, and second; that they have to walk with non-believers for a long time in order to have us convert, following this up with a story of someone who converted her spouse after 30 years. The main purpose of his talk, revealed at the end, was to encourage them to learn the arguments more thoroughly, and to learn apologetics within their various church groups. The next speaker was a biochemist who used the design of a cell and ATP Synthase as an argument for design by a higher power, which is, of course, the watchmaker argument. Here is a video from The Discovery Institute, that basically lays out his same argument: https://www.youtube.com/watch?v=XI8m6o0gXDY. Regardless of his glaring ”god of the gaps” arguments within the presentation, I did appreciate that the room was filled with Christians from various churches and he tried to move many of them forward in understanding evolution ( from his view as the method God used to create us) and later in the breakout sessions he challenged the young earth creationists in the crowd with a talk entitled Age Of The Earth. At lunch I listened in on a few groups discussing the first speaker and how they felt frustrated with it because they weren’t given any magic answers, and that they had been lost during the science talk. I also took some time to walk through the exhibits on display in the gym hall. As expected there were many pro-life groups present, Gideons, Christian Universities, and a mix between old earth groups and young earth creationist groups. After lunch we broke out into different sessions, which you had to choose when you booked your ticket. There were at least four I was interested in, but I eventually settled on two that specifically seemed to focus in on atheism/secularism. Unfortunately, both devolved into pro-life discussions. The first discussed medical assistance in dying and the issues they have with that, the other eventually worked it’s way into a discussion about abortion. After dinner we were all called back into the sanctuary to hear the final speaker as a group, an openly gay minister within the church who was going to address LBGT+ issues. I tried to hold judgement until after the speaker presented, but was worried the talk would basically boil down to ”you can be gay, you just have to be celebate if you want to follow Christ”. Unfortunately, I was not wrong in my assumption. I felt a flush of anger at first, and then as I listened to him talk about his struggles and how churches need to be community and provide friendship intimacy for their LBGT members, I felt a profound sense of sadness for him, and for any LGBT person that he ministers to. There was a story of a gay man who came to him who had been in a 15 year partnership but he also wanted to be a Christian. The advice to the man was to give up his relationship as that is what scripture teaches, with references and quotes from the bible to back up that advice. We were not actually told the outcome of that meeting, however. During the entire talk there were references to ”trusting in Jesus” and ”trusting in the word of God” but it became apparent to me what was actually being done was ”trust in the interpretation of this verse (and how it was taught to me)”. A personal relationship with Jesus was mentioned throughout the entire day, and it became glaringly obvious that this particular group of Christians (evangelical) were not interested in allowing a personal relationship with Jesus unless it was their approved version of one. This approved version that has been taught to them in the first place based on someone elses interpretation. I know many people who are able to reconcile their acceptance of LGBT+ (without contingencies), while retaining their faith. So, then I was angry again at the attendees and speakers, that they were choosing more hateful interpretations instead of the loving ones, all while pretending they had the moral highground and that somehow what they were doing was more loving. In a funny twist, it turned out the only presentation I actually enjoyed was ”The Atheist Experience”, the topic I was most worried about misrepresenting us in the first place. The two breakout sessions sparked a new resolve in me to continue fighting to end funding for Catholic health care institutions in our province (and elsewhere), particularly in areas like palliative care, that deny our legal rights to things like medically assisted deaths. Finally, the last speaker encouraged me to be a better ally and to continue to stand up for LGBT rights, and to support religious groups that take progressive and liberal views on these issues in order to help create change from within. So if their goal was to spark renewed activism in the attendees, it certainly worked for me, just not in the way they were hoping for.